They account for 25% of the U.S. population. They make 21% of consumer discretionary purchases. This is estimated to be over a trillion dollars in direct buying power, and it has a significant influence on the older generations. 1 in 4 Millennials are parents today. They are social—40% of Millennials have 200+ friends on Facebook compared to 19% of non-Millennials. Millennials are 2.5 times more likely than other generations to be early adopters of technology. 80% of Millennials want brands to entertain them. Today’s marketers must identify the best media types to effectively communicate with Millennials. Although some might think that direct mail is only for Baby Boomers, InfoTrends’ research indicated that Millennials are also responsive to direct mail marketing. Millennials reported reviewing about 67% of their direct mail pieces, and this is consistent with the open rates for older generations. If the direct mail piece had a QR code, over 45% of Millennials scanned it with a mobile device versus about 20% of those aged 50+. 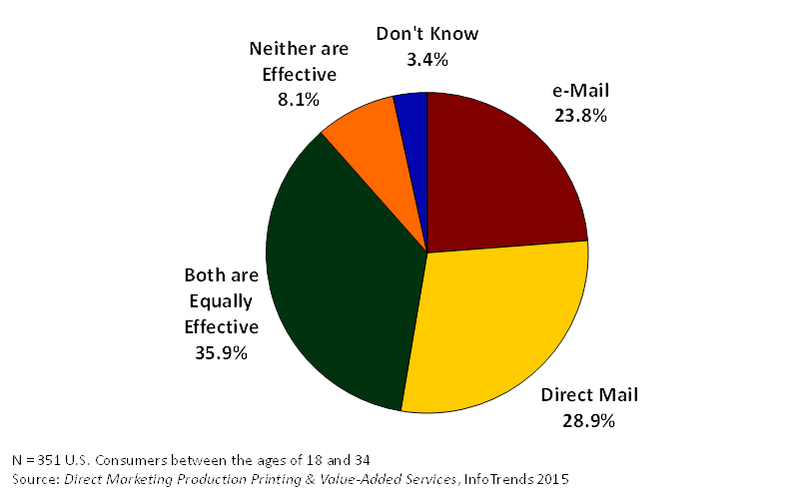 When asked about preferences for direct mail versus e-mail, nearly 29% of Millennials said that a tactile piece of direct mail was more effective at getting them to take action. Meanwhile, less than 24% reported that e-mail was more effective. Figure: Which is more effective at getting you to take an action, e-mail or direct mail? Although Millennials are hooked on technology communication and spend a lot of time on the Internet, they have become numb to digital advertising. This is precisely why an envelope in the mailbox cuts through the clutter and still grabs their attention. According to the Quad/Graphics Customer Focus® 2014 Research Study on Millennial Channel Engagement, the most three popular types of direct mail that Millennials read include retail (82%), grocery (79%), and clothing (69%). Furthermore, direct mail is a driver of web traffic—over 84% of Millennials prefer to respond to direct mail by visiting the company’s website (via PC or mobile device). Millennials are substantially more likely than any other generation to respond via web. According to research by Cassandra, Millennials are careful with their money. These diligent researchers always consider whether something is a good investment and are less likely to make impulse purchases. According to Quad/Graphics, the most popular offers among Millennials include Buy 1 Get 1 Free (57%), gift cards (55%), and percent off total purchase (51%). Millennials that respond to direct mail will do their research before making a purchase, consulting online reviews, blogs, and product experts to learn more and make price comparisons. Make it simple: In today’s “always on” world, Millennials want answers immediately. They need to be informed right away about a product and its benefits. Information has always been just a click away to these consumers, so marketers risk losing Millennials if they force them to watch a video, create an account, and/or wait for an e-mail confirmation. Make it personal: Millennials are hardened by a lifetime of managing spam e-mails. To be effective, direct mail must be relevant to the individual. Relevance instantly adds a degree of appeal and believability to a direct mail piece. Make it interactive: For young adults who have been inundated by online requests and marketing initiatives, direct mail has a certain credibility. It can also be tremendously effective for leading Millennials to online resources. When it comes to marketing success, the right blend of print versus digital is critical. Make it omni-channel: Brands must ensure that their product information is available in all forms—mobile, in-store, online—so Millennials can access it anytime and anywhere at a moment’s notice. Millennials should also receive a consistent message as they navigate across various channels. Marketing to Millennials isn’t optional for marketers; these consumers possess a huge amount of purchasing power. In today’s “all channels on” environment, direct mail continues to cut through the clutter. Service providers must work with marketers to develop fully integrated marketing plans that comprise newer mediums like social, while still understanding the importance of more traditional printed assets.